Place: Atlantic Beach, North Carolina. All entries must be received by 2:00pm on July 28, 2018. North Carolina Ducks Unlimited asks that one entry per participant be donated to the evening’s auction. All competitors will receive a banquet ticket to the Saturday night event. 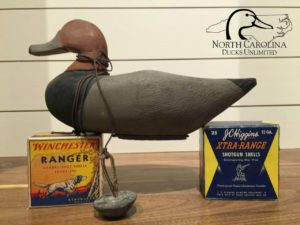 Entries must appear to be in the style of traditional North Carolina decoys. Decoys may be made in the style of any pre-1950 wooden or canvas-over-wire decoy made from Currituck Sound and Back Bay to Bogue Sound, including the Mattamuskeet Lake and East Lake areas. Replications will not be accepted, and all participants must be North Carolina residents. Decoys should be made totally and wholly by the participant and no class decoys are allowed. Decoys should be made of wood or canvas-over-wire. No cork, foam, or plastic decoys will be allowed. No relief carving is allowed. Decoys may not have carved wings or feathers, mandibles, nostrils, or nails. Only carved eyes and bill delineation are allowed. Any present crests may not have incised carvings, hair inserts, or leather inserts. Paint should be in the traditional “block” style, though stippling, wet-on-wet, pineappling, and gum-brushing are allowed. Entries may not have glass eyes but may feature carved or painted eyes. Decoys without the presence of eyes are also allowed. Eye “channels” or grooves are not allowed. Each decoy must be marked with the maker’s mark prior to competition. Judging will be done while floating, with final assessment will be made from greater than 20 feet. 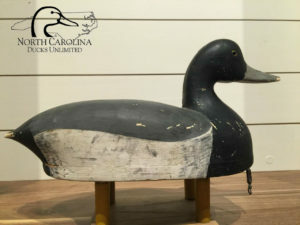 Entries will be judged on (1) likeness to traditional North Carolina working decoys, (2) likeness to species, (3) floatability, and (4) the judges’ overall preference in appeal. Entries must float, remain self-righted, and remain intact, under normal circumstances, throughout judging. All decoys must have an attachment for a line tie. Carvers may enter up to 3 decoys. There is no admission fee. Top 3 entries and associated rights become property of North Carolina Ducks Unlimited upon award. One does not have to present to compete. Mail in entries are allowed. Contact chase.luker@gmail.com to arrange mail in entries. Prizes and trophies will be awarded to 1st, 2nd, and 3rd place. 1st place will receive $500, $250 for 2nd, and $150 for 3rd, all of which are purchase awards. One entry per participant is requested as a donation in lieu of entry fee.